Chad Finchum of Knoxville had a phenomenal 2013 racing season in the Volunteer State, capturing the Kingsport Speedway and Tennessee State NASCAR Whelen All-American Series Late Model Stock championships. The titles earned the Chad Finchum Racing team an invitation to the prestigious NASCAR Home Tracks national banquet last December held at the NASCAR Hall of Fame in Charlotte, N.C., where he was recognized with all other state champions. Finchum thought all the accolades extended him for his accomplishments were finished. However, the icing on the cake was an appearance in Nashville at the Tennessee State Capitol prior to start of the 2014 racing season, where Finchum and his family were honored by Gov. Bill Haslam in his office for their Tennessee State NASCAR championship. “Wow, what a really cool deal that was to meet with the governor,” Finchum recently said. “There’s no doubt about it, the word ‘NASCAR’ carries a lot of leverage and can open doors. That’s one of the best experiences I’ve ever had. When you think about every citizen in the state of Tennessee, there’s only a small percent that will ever get to spend time with the governor. 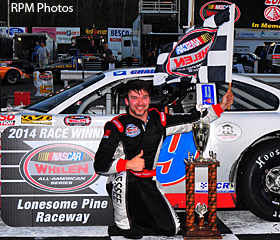 In 2014, the 19-year-old Finchum looks to conquer the Commonwealth by winning the Lonesome Pine Raceway Late Model Stock championship, and hopes to contend for the NASCAR Whelen All-American Series state title. He’s off to a good start through the first four events of the season at LPR, located in Coeburn, Va., having recorded three feature wins to go along with one fourth-place effort. Saturday night (May 3), Finchum qualified third-quickest behind Brian Blevins and Kres VanDyke. But with the invert being “three,” he started the 60-lap Late Model Stock feature from the pole. Finchum raced side-by-side with VanDyke for the opening three circuits, before powering his Ford Fusion into a lead he would never relinquish. “I knew we had a very good car, because we ran well in the afternoon during practice,” said Finchum following victory lane ceremonies on the front straightaway and making his way back over to his pit stall. “Qualifying was close between the top five cars. I really believe I could’ve been fastest, but I just tried too hard on both qualifying laps and didn’t lay down perfect runs and we were barely nosed out by (Brian) Blevins and Kres (VanDyke). Finchum cruised to the impressive flag-to-flag run to victory over VanDyke, Michael Kidd, Ryan Stiltner and Blevins. “Tonight’s our third win out of four starts here at LPR to begin the season, and it’s good to be sitting atop the point leaderboard,” Finchum stated. “You don’t want to get off to a bad start and then have to climb your way back into contention when you're trying to win a championship. We really got off to a great start by winning the twin features, and then the following week we were just off with the car, didn’t quite get the setup like we wanted. Focus for Chad Finchum Racing will now switch to Kingsport Speedway, for exciting NASCAR Whelen All-American Series racing on Friday, May 9 in the Model City. Chad Finchum Racing, owned by James and Linda Finchum, is headed by crew chief Patrick “Dinky” Torbett (2013 NASCAR Whelen All-American Series UNOH Ultimate Mechanic Challenge Award), with crew members Tony Cordell, Tyler Reed, Eric Romines, J.E. Blankenship, Sam Couch and Jacob Rubel. Supporters for Chad Finchum Racing in 2014 on the No. 19 Ford Fusion include: A-1 Finchum Heating & Cooling, Texas Roadhouse, Finchum Paint & Body, Loveland Baptist Church, RW Race Engines, Five Star Race Car Bodies, CARS Etc., and Hedgecock (Race Cars) Racing Enterprises. To learn more about possible sponsor opportunities with Chad Finchum Racing, contact James Finchum at (865) 740-3535. To keep up with Chad Finchum’s racing throughout the season visit his website at www.ChadFinchum19.com or follow him on Twitter @ChadFinchum. Finchum took win number three this past weekend at LPR.